The 2019 draft marks the fifth year from which we’ll have data on every FBS prospect for the evaluation process. That first 2014 season, we wrapped up our collection processes well after the season had ended with only a little time to come to some conclusions about prospects. While we only had one season to work off of then, we now have the entire careers graded of the 2019 draft class. Let’s take a look back through the years at the players whose grades were superb in college and translated to the pros. 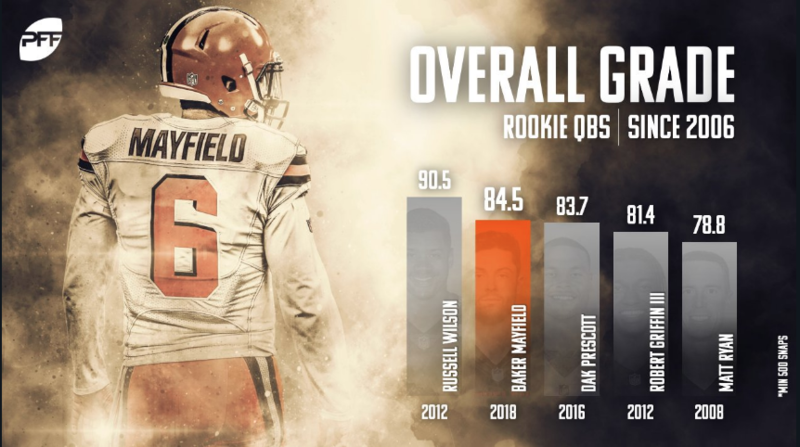 When he came out this past year, Mayfield had the two highest-graded seasons we’ve ever seen from a quarterback in our FBS grading. Even after doing advanced quarterback charting, every single data point suggested he was head and shoulders above the others in the rookie class. 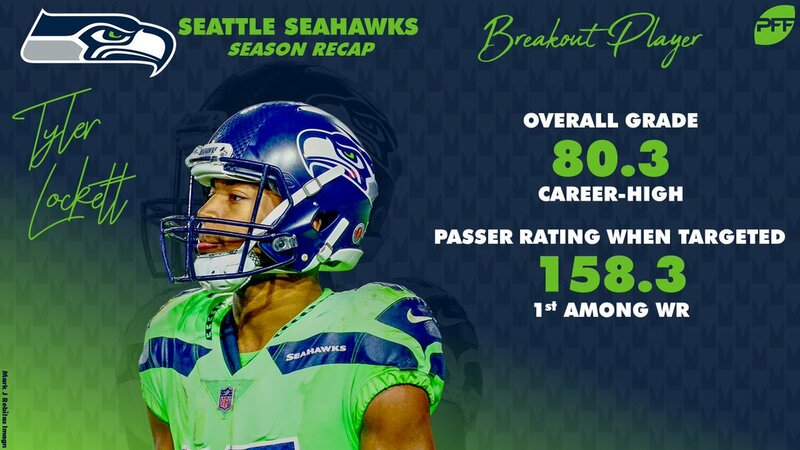 All he did in his first year in the NFL was break the rookie passing touchdowns record, win PFF rookie of the year, and become PFF’s second-highest-graded rookie quarterback ever. We had only one year of Flowers graded back in 2014, but even then we knew it was special. His 90.9 grade – against SEC competition no less – was the fourth-highest in the country that season. The four players higher than him? Frank Clark, Joey Bosa, and Myles Garrett. He kept elite company then, and he keeps elite company now after a 90.4 overall graded season has him on the brink of breaking the bank in free agency. Jarrett was supposed to be too small to hold up at the NFL level. He was PFF’s highest-graded interior defender back in 2014 but fell all the way to the fifth round of the 2015 NFL draft. He didn’t quite hit the ground running, but Jarrett has improved every season and polished off a career year in 2018 that saw him grade out as the fifth-best interior defender in football. Lockett was PFF’s fourth-highest-graded receiver in the FBS his last year at Kansas State in 2014. That season, he racked up 1,351 yards, nine touchdowns, 93 catches, and only six drops. He looked like a star early on in his career in Seattle before a gruesome leg injury derailed his career for a bit. This past season though, Lockett put together one of the most efficient seasons from a wide receiver in NFL history. He had a perfect passer rating when targeted, caught 61 of his 71 targets, and didn’t drop a single pass. Ramczyk only played one year of FBS football after transferring from Wisconsin-Stevens Point. However, that season was one of the best we’ve ever seen from an offensive lineman. Ramczyk allowed only 12 pressures and was the highest-graded tackle in college football. He’s been undoubtedly the top offensive tackle from that draft class and was the third-highest-graded right tackle in the NFL this past season. Yet another guy from the 2015 draft class. We really didn’t know exactly how our grades would translate from college to the NFL that first season. When it came to offensive linemen hailing from a triple-option offense like Mason’s at Georgia Tech, we had even less of a clue. He was PFF’s fifth-highest-graded guard in college football that year despite running an offense that had very little translatability to the NFL. Those question marks dropped him to the fourth round of the 2015 draft. While it took him a bit to get up to speed in pass protection, Mason was the highest-graded guard in the entire NFL this past season. Heading into the 2016 NFL draft, we banged the table for Jones as a game-changer on the interior. That 2015 season it was Jones – not DeForest Buckner, Sheldon Rankins, Kenny Clark, Robert Nkemdiche, and Vernon Butler – who had the highest pass-rushing grade among interior players in college football. There were effort concerns, and his box score stats weren’t great, but make no mistake he had elite production. This past season, Jones trailed only Fletcher Cox and Aaron Donald in pass-rushing grade, racking up 16 sacks from the interior in Kansas City. A torn ACL robbed us of what was the makings of another special season from Lawson, but even his rookie year was enough to prove he was a steal in the fourth round back in 2017. Lawson had the second-best pass-rushing grade in college football back in 2016 and came into the NFL and led all rookie with 59 total pressures – including 10 sacks and 11 hits – in 2017. Schobert is a great example of the grades highlighting a skillset. He was superb as an edge-rusher at Wisconsin even though much of his production came on stunts or against tight ends. That ability to take on blocks has translated to him being one of the best off-ball linebackers in the NFL though. The former fourth-round pick was the 10th-highest graded linebacker in the NFL this season. Much like Schobert, the grades highlighted King as an exceptionally skilled defender, yet one who probably wouldn’t translate as an outside corner at the NFL level with his athleticism. King was the third-highest graded power-5 cornerback in 2016, and he had three years of overall grades over 87.0. He’s gone to the Chargers though and been unquestionably the league’s top slot cornerback since he came into the league. 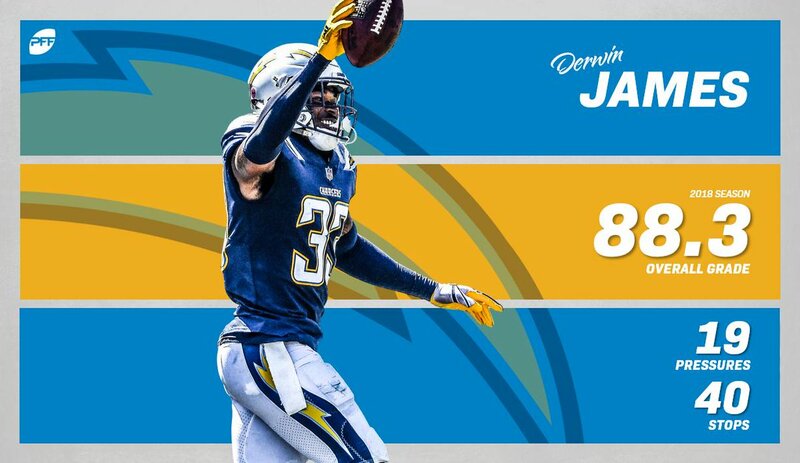 He was the second-highest-graded corner in the NFL this past season and a PFF All-Pro. While he still ended up as the 17th overall pick, James’ college grading suggested a sure-fire top-five type of talent. James was the highest- graded safety in the country as a freshman. He was the highest-graded safety in the FBS once again as a junior, even though a few unsightly plays had many claiming he took a step back. For unknown reasons, James fell in the draft, but he made teams immediately regret it. James was the fifth-highest-graded safety in the NFL as a rookie with one of the most impressive rookie seasons we’ve ever seen.